What does it mean to be a woman who reads? This is the primary question Sarah Clarkson seeks to answer in her wonderful new release, Book Girl. 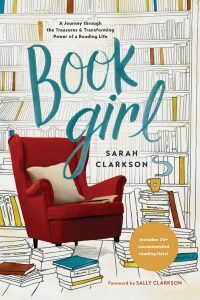 Filled with over twenty recommended reading lists, Clarkson’s latest work is not merely a manifesto for naturally bookish girls and women who need little encouragement to read; it is also a thoughtful reflection on why reading matters as an ennobling, transformational act of true leisure in an era of exhausting entertainment. I am a lifelong reader. As an undergraduate student, I had an epiphany that now seems obvious, but was startling at the time: not everyone has been shaped by stories. Or at least not by beautiful stories. We’ve all been shaped by a story of some kind—as human beings we cannot escape this fact—but as a young woman I began to notice that when I felt an immediate connection with another person—that special spark, the whispered promise of a kindred spirit—it usually didn’t take long for our conversation to turn to books, of which there were often several shared favorites. Similarly, when I encounter another person whose imagination hasn’t been shaped by books, there’s often the sense that a sort of chasm exists between us, meaning it will take more time and effort to build the bridge that enables us to understand each other. Perhaps this seems judgmental in an age where personal preference is king, but I don’t think the disconnect is simply a matter of “different interests,” as if reading were another hobby among many possible pastimes. It wasn’t until I discovered Russell Kirk that I was able to articulate the nature of this gulf—that without a “moral imagination” shaped by the timeless myths and universal stories that allow us to unearth the complexities of the human heart and the sacramental nature of our world, we tend to live isolated within our own private experiences in our own time and place. As a result, we lack the empathy and childlike wonder needed to even see the bridges that might be built between souls. Yet Clarkson’s writing does not contain a hint of snobbery or trace of condescension, no self-congratulatory sense that being bookish automatically makes one more virtuous or enlightened. Instead, Book Girl is like a warm invitation to a party where it’s impossible to arrive too late. It’s the perfect gift for a teenage girl who voraciously reads the latest “young adult” release but hasn’t yet explored the deeper riches of a reading life, or the young mother who’d rather consume something of substance than scroll through social media during those late-night feedings but doesn’t know where to start. A woman who reads is a woman who chooses joy.